Acacias and cafes exist in two parallel worlds, the human world and the natural world, and in these worlds they perform similar functions. In our world cafes have become popular meeting places as well as eating places. They are casual offices for people in all walks of life where they plan their work day and have relaxed discussions with colleagues. Cafes are places where we take some time out and escape the pressures of the day. Acacias are the cafes of the Australian bush, the busy meeting places that provide a range of tempting foods for birds, mammals, insects and even humans. Like any good café, an acacia provides a range of edible products like nourishing pollen from the beautiful yellow pompom flowers, tasty seeds from the green bean shaped pods, life sustaining sap that oozes from the trunk and edible leaves of an extraordinary variety of shapes and colours from vivid green to blue-grey. ​For example the native and introduced honey bees collect the spring pollen to feed their growing broods, ants gather seed for the oil rich aril attached to the end of the seed and store it in their underground larders. The many types of small gliders like the Sugar Gliders depend on the protein rich wattle sap so much that they guard their family’s wattle trees from other glider intruders. On the shaded ground the Bronze-wing Pigeons peck at the protein rich black wattle seeds before they are carried away by diligent ants. For us, the lumps of soft gum called kino that develop on the wattle trunk are a natural though very sticky chewing-gum that slowly dissolves as you chew. In certain species, like the Golden Wattle (Australia’s floral emblem) and the Black Wattle, the gum is mildly sweet and a recognised food of the First Australians who sweetened it further with native mint or banksia nectar. Wattle seeds have a nutty flavour and when roasted they can be added to muffins or brewed to make a coffee flavoured drink. In fruit or nut trees, the flavour varies with the variety and so it is with acacias. 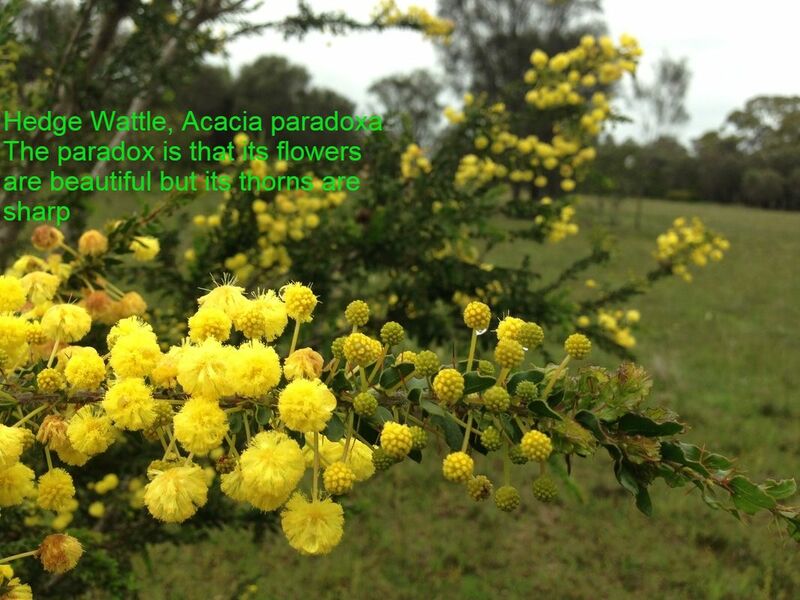 Some of the nicest flavoured wattles are Prickly Acacia, Coastal Wattle, Desert Oak, Colony Wattle and Mulga. However Wirilda is the wattle considered to have the nicest flavour of all. For those of us that frequent cafes for a light lunch then the Witchetty Bush would provide an unusual choice. Can you imagine the eye brows rising as customers read, Baked Witchetty Grub with a tossed garden salad - $15? 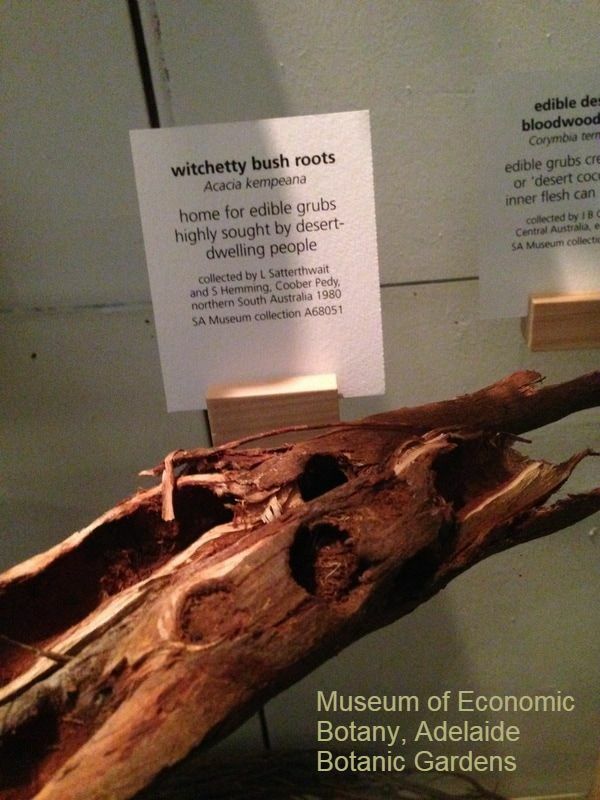 This shrubby acacia is found in every state except Victoria and NSW and its roots are home to the Witchetty Grub which was a valued high protein food for the first Australians. Cooked it tastes like scrambled eggs, raw and wriggling it has an almond flavour. A café favourite of mine is apple and cinnamon cake. Acacias can match this combination firstly with the Mulga apple, a welcome find for thirsty travellers in central Australia. The galls that grow around a wasp lava look like small apples and are sweet eaten raw or cooked in a camp oven and have a flavour of dried apple. The Cinnamon Wattle is likely to enchant you with a cinnamon aroma released from its leaves particularly on hot days. Interestingly a form of this acacia called ‘Scarlet Blaze’ unusually has vivid red pompom flowers with golden tips. A good café has an enticing ambiance that both relaxes and excites the senses. Acacias provide all this and more with their beautiful spicy aromatic flower scents. My personal favourite is the pungent aniseed scented Black Wattle. The most impressive of all however is the oil extracted from the Silver Wattle. This is described on the bottle as having a ‘wonderfully rich, honey sweet, floral woody aroma which is uplifting, relaxing, calming, anti-depressive, aids happiness and calms noisy children. The latter effect being somewhat the opposite of a strong coffee. Birds and small mammals seek out the refuge of acacias particularly if they are the bushy and/or prickly varieties. Here they can escape from the stresses of open areas where there is constant completion for food with other native animals or perhaps when the cut and thrust of avoiding being eaten by predators just becomes too much. Do you know the feeling? Like a pop-up cafe, acacias are often the pioneers, growing up overnight in tough and exposed environments and providing much needed shelter for wildlife where little or none is available. In true pup-up café style many species have only a short life of 7 – 20 years, but their presence and fast growth paves the way to enable other longer lived trees and shrubs to colonise and thrive. Similar to the timeless century old traditional coffee houses in Europe there are some acacias that are notable long lived exceptions. The Blackwood is an acacia with attractive dark timber that has furnished many Australian homes. It can live for over 200 years. The beautiful grey leafed Weeping Myall that grows in the dry regions of the eastern states can also live for two centuries. Remarkably the Western Myall from South Australia and Western Australia is known to live for more than 250 years. The view from entrance and the solid stone steps of the café as we looked into the shady garden was of a beautiful flowering acacia from the dry centre of South Australia. The Flinders Ranges Wattle with its sprays of glowing yellow pompoms will brighten any grey winter’s day. As we walked past this acacia toward the car it seemed appropriate that a Wattle Bird should squawk and dash out of its grey foliage into the contiguous blue, linking the two parallel worlds of this outback acacia and the urban bluestone cafe.